It's been while since I've blogged regularly enough to be able to offer a freebie like this to all of you lovelies, but this month I'm back at it! The folks at Grove Collaborative are offering all new customers their exclusive cleaning concentrates bundle (worth over $30) with your first order of $20 or more. For the last couple years, I've ditched regular all-purpose cleaners for homemade versions, and I must say: I'm never going back. 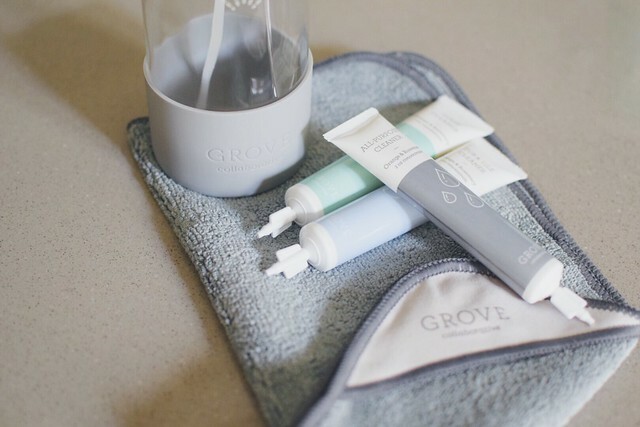 I typically use a concentrate blend from Young Living or this favorite recipe, but I'm loving the convenience and simplicity of the Grove Collaborative concentrates. 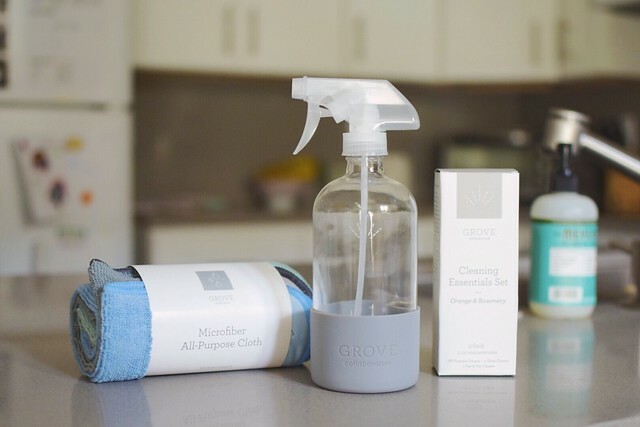 I'm basically obsessed with their glass spray bottles (I have several I use regularly) and this set comes with one that also has a silicone sleeve, which not only looks pretty sitting on my kitchen counter but is also much more safe. I've been a loyal Grove customer for years now, and can't say enough about this company. And just because I'm an affiliate doesn't mean I'm swimming in free products in order to promote them—most months I continue to order from them, referral credits or not (which is saying something for this gal, who is quite addicted to Amazon Prime). 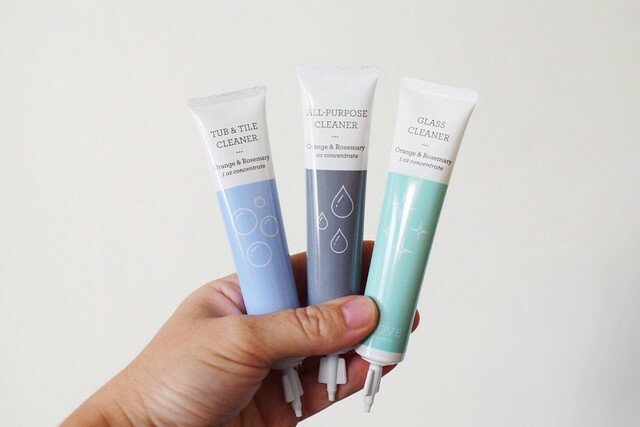 They have such a huge selection of natural and organic products at great prices, and I love everything I've tried from their own brand, as well. 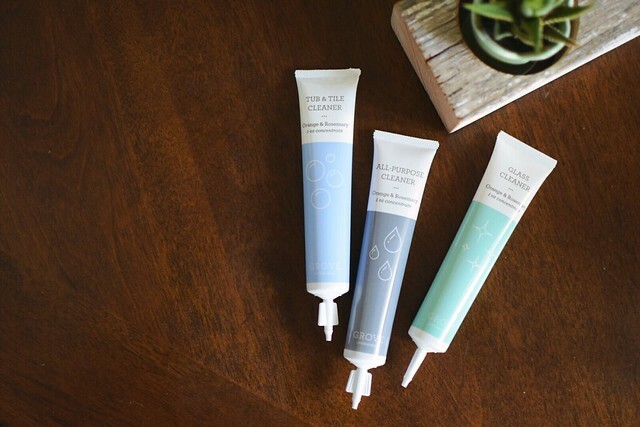 They have everything you need from home and cleaning to baby and beauty—from brands like Method, Mrs. Meyer's, Acure Organics, Babyganics and so many more. Yes, I love them so. And here's now to get it! 1. Sign up for Grove Collaborative here. You will receive the concentrates bundle for free when you sign up! 2. To receive this offer, your order needs to be a minimum of $20. Choose the combination of products and scents you love and want to receive in your first box. 3. You made it! Click Finish & Pay and you'll receive your order within a few days. — I know some of you are already Grove Collaborative customers, so if you're in the mood to receive some walnut scrubbers with your next shipment, just click on over here and they'll be added for free. Hooray! This offer is good through Sunday, October 15th, 2017 at 6PM PST. As a reminder, you are never required to make any purchase from Grove Collaborative beyond the first shipment you receive. Every month they will send you an email letting you know your monthly order will ship soon—from there, you can either empty your basket to skip a month, fill your basket with whatever you happen to need, or cancel your account altogether. No pressure! I hope some of you are able to take advantage of this great deal and begin ditching your harsher daily cleaners for good. Baby steps to green living are the best steps, my friends. Enjoy! Affiliate links included in this post; view my disclosure policy here. Thank you for your support!